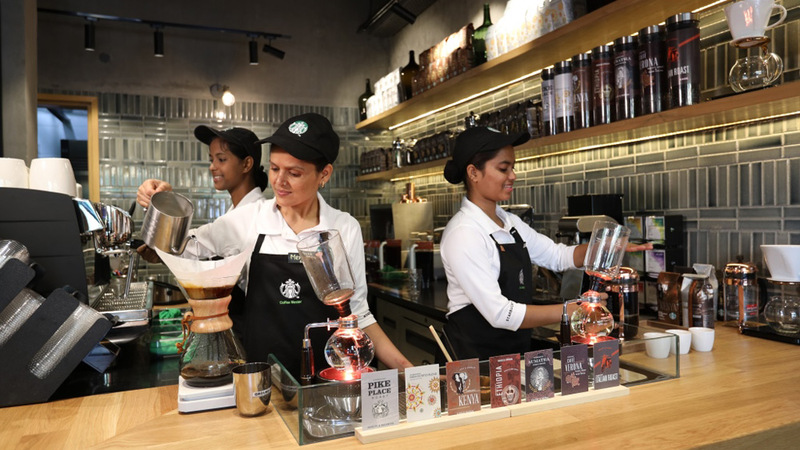 Tata Starbucks Private Limited today reaffirmed its commitment to deliver the unparalleled Starbucks Experience with the opening of the ninety-thirdstore, which further brings customers closer to Starbucks. Located in the heart of the popular Lokhandwala neighborhood in Andheri West, the store is the first in India to feature eye-catching brewing methods, including a state-of-the-art White Eagle espresso machine, Chemex® and Siphon. Designed to integrate coffee education with discovery, the brewing methods demonstrate how different methods can have a surprising effect on the flavors of the coffee in each cup. At the store, the theater and artistry of coffee is on display from the golden glow of siphons at the coffee bar, to a curated range of coffee-inspired artwork, including artisanal block printing and pattern, to the wooden furniture and burlap upholstery reminiscent of the deep earthy colors of coffee.The store design and craftsmanship is an homage to coffee’s rich heritage. Each coffee also is hand-selected to perfectly complement Starbucks new food offerings in the store. From the moment customers walk in through the doors, they are welcomed by the aroma of the freshly brewed coffee crafted by Starbucks Coffee Masters who passionately share the journey of the coffee bean. These baristas have completed a rigorous certification process and have earned the distinguished Black Apron afteran intensive coffee skills and knowledge training. Currently, there are143 certified Coffee Masters across Starbucks stores in India.